Centre Stage Youth Theatre was formed in 1996 with 6 enthusiastic adults whose purpose was to set up a society with the object to educate the members in the dramatic arts. That objective still stands today, and remains the purpose why so many people put so many hours of time and effort into the society and it's members. Online tickets are usually available for this society. Congleton Amateur Youth Theatre was set up in 1990, with a small adult organisation running it. It now runs with an elected committee, putting on a number of different shows each year. 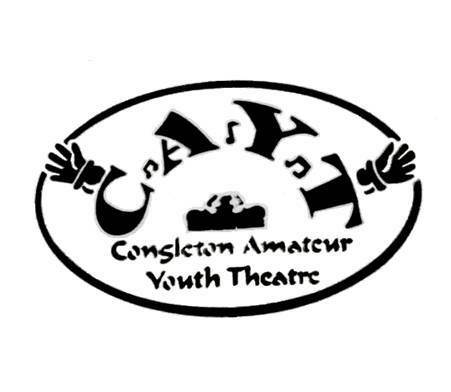 Congleton Amateur Youth Theatre has a membership ranging in age from 9 to 21. For more information about this group contact the society's Registrar, Jannine Jennings on 07713 90059. or visit their website. The society was formed in 1932 and until 2009 was known as Congleton Amateur Operatic Society. In 2009, we set about modernising and updating the society to face the challenges of modern day amateur musical theatre. Our new name, Congleton Musical Theatre, better describes our objectives and reflects the shows that are available to perform and appeal to the audiences of today. Although we are an amateur society, we always aim to produce a professional show, and are delighted to have been nominated for nine N.O.D.A. North West Awards over the past 8 years. We produce one show per year in October, rehearsals running from April to October and always welcome new members whether, acting, back-stage, or front of house. Congleton Pantomime is a society which produces an annual Pantomime at Daneside Theatre in Congleton. It has members ranging in age from eight to eighty. Some members appear on stage, some help backstage, some help by serving on the committee that manages the group. All are valued for the contribution they make and new members are made very welcome. For more information on this society visit Facebook or Twitter. Congleton Players Amateur Theatre Club prides itself on bringing affordable theatre to the community of Congleton and others in the North West, from thrillers to comedy classics. Each year, between October and April, we stage three plays. Open auditions mean all members have a chance to 'tread the boards'. Many members contibute their creative talents by becoming involved in set design and construction, make-up, costume and props, lighting, sound and other areas vital to the staging of a successful production. For more information on this society visit their website or email. "Our Gang" isn't really a society at all, but is the Congleton Scouts and Guides Gang Show. The show is produced every two years, and although some members of the cast have appeared in a number of the shows since it started in 1972, many new members join the cast every production.